I don’t normally like making hors d’oeuvres, dumplings, or even cookies that require anything besides dropping, because I am lazy in this very specific respect. But my advisor’s weekly “secret” seminar has treats (the speaker from the previous week brings treats for the following week), and I thought I’d try something crazy and wild. So I bought a can of crescent roll dough (key to making the amazing easy cinnamon buns) and a bag of sweet mini peppers, and figured I’d figure out the rest the day before seminar. I was surprised that I couldn’t find exactly what I wanted by googling, so here’s a Yen original recipe. What actually happened was that I wanted to make pigs in a blanket, but then remembered we had a vegetarian in the seminar, so I bought the peppers instead. 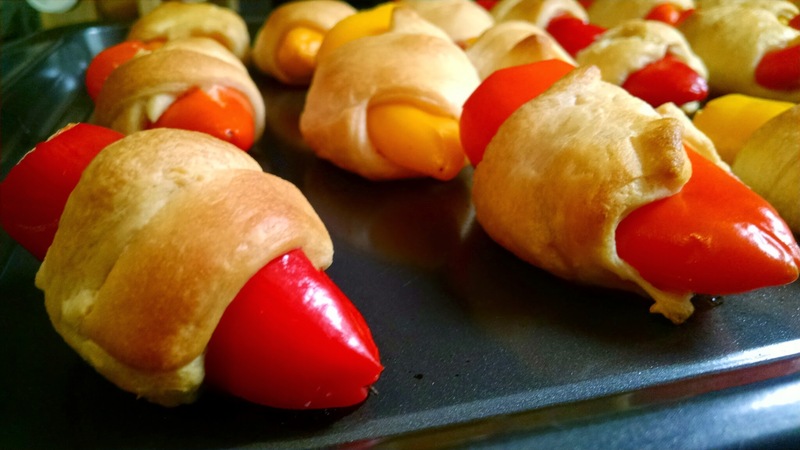 These turned out AWESOME- the sweet peppers popped a bit, the paprika + pepper jack made it a little bit interesting, the cheesy filling was so creamy and offset perfectly the crispy buttery crescent roll dough. I highly recommend. There are two annoying things to do: one, seed the peppers. I was lazy and just chopped off the tops to take out the seeds, but they’d look prettier if you left them on and cut a slit to pull out the seeds. Two, fill the peppers. 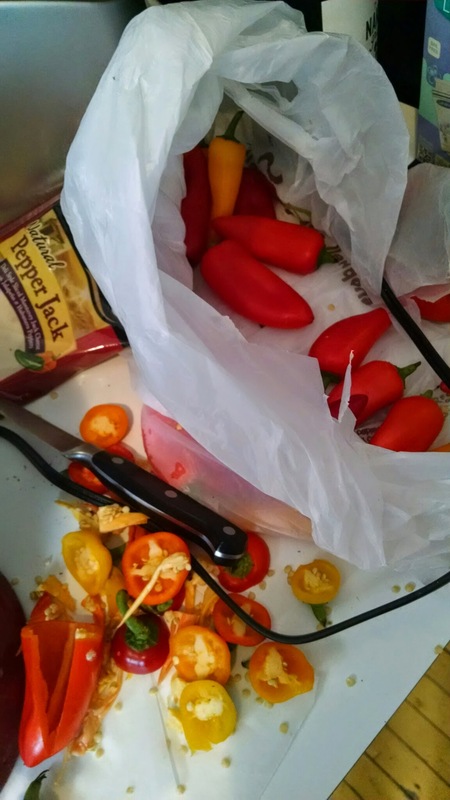 I used a regular knife to fill the peppers. 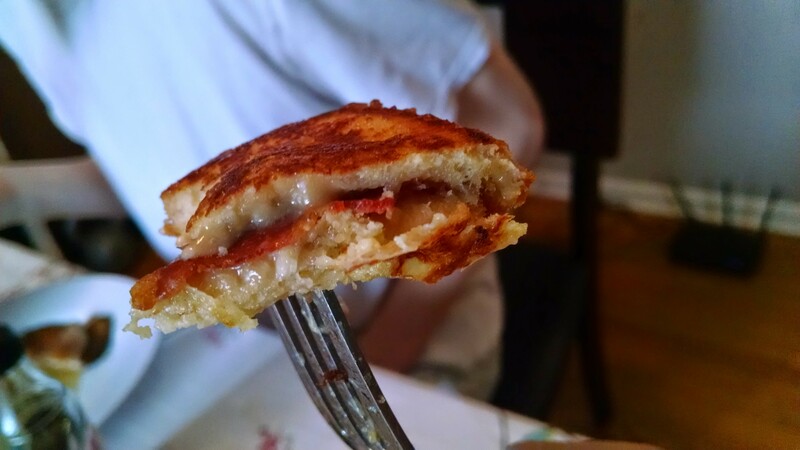 The filling was a block of cream cheese + a few slices of pepper jack cheese + paprika for color. These would also be great with some sliced green onion, any other sliced cheese, and any other savory spice. Using a mixer to whip the cream cheese was key for making the filling spreadable, and it also spread out the sliced cheese very well. 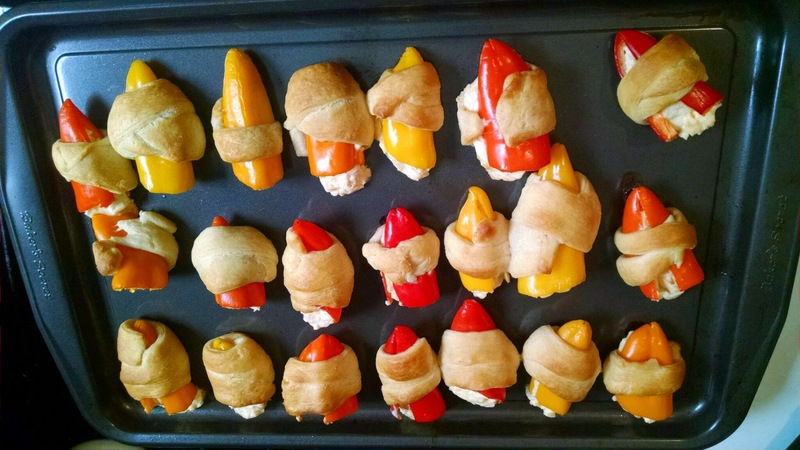 Third annoying thing that was less annoying because it meant we were close to done: wrapping the peppers in crescent roll dough. But academics isn’t everything. I don’t want him to tear up if he messes up on a test. Just roll with the punches, baby! Also I got to use our pizza cutter, which we never use! I don’t know if we’ve ever used it on pizza. Or made pizza. Hmm I should make pizza! These are both adorable and misshapen. If you’re a fancy Pinterest-er who follows food blogs, I’m flattered you look at this and you should make these and make them more beautiful and tell me about it. If you’re not a fancy Pinterest-er, you could make these and really impress people with them because they are so delicious and don’t need to be beautiful. And they come out beautiful anyway! Set the oven to 350. Seed your mini peppers by slicing them the long way and scooping out the seeds w/knife, or just cutting off the tops (the seeds are connected to the tops). You’ll still want them sliced the long way. 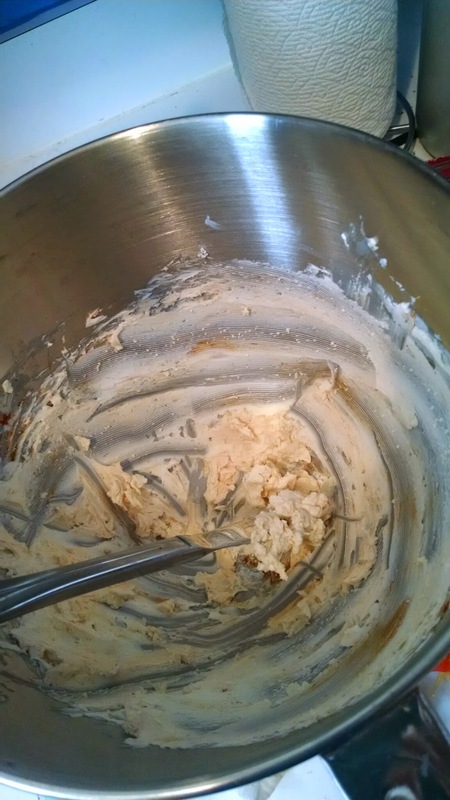 Use a mixer to beat the cream cheese w/cheese and paprika. 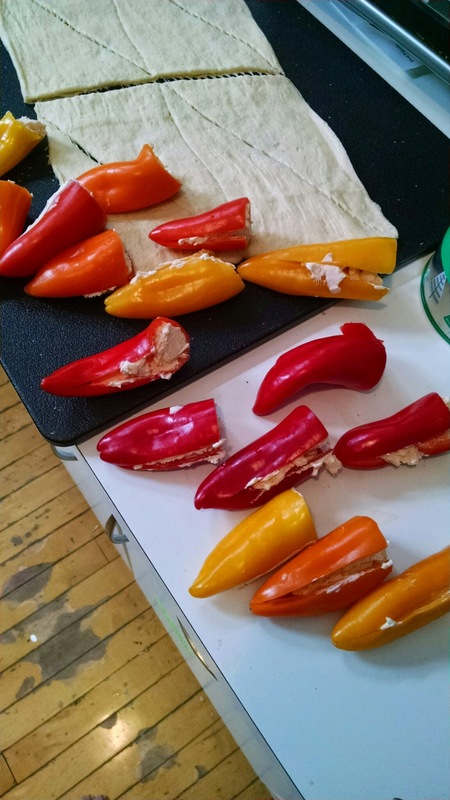 Use a knife to scoop a small amount of filling into each mini pepper. Roll out the crescent roll dough. Use a pizza cutter to cut each triangle into three slimmer triangles, or be lazy as I was above and just cut strips. 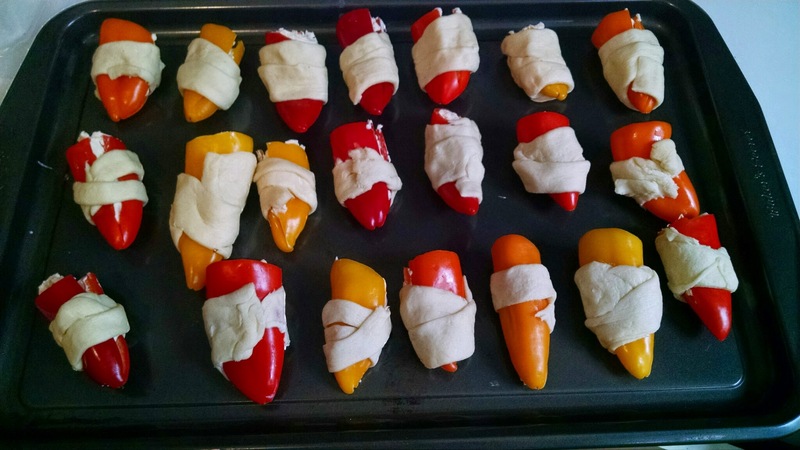 Wrap each pepper with a small triangle or strip of dough. 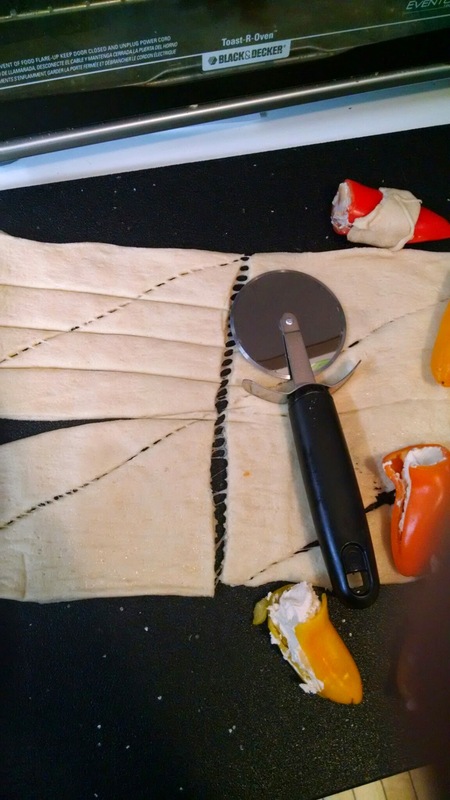 If there’s leftover dough, just press it onto a larger pepper. Bake for 15-20 minutes, until dough is golden brown. This is a ridiculously decadent and delicious breakfast. Crispy salty bacon, sweet maple filling, and rich eggnog. You can make this without the leftover eggnog (use eggs+milk+sugar instead), or without the bacon. It’s so good. Pros to this dish: all delicious ingredients, all delicious. There’s no way this is BAd, no CONs at all, even if you forget the bacon. 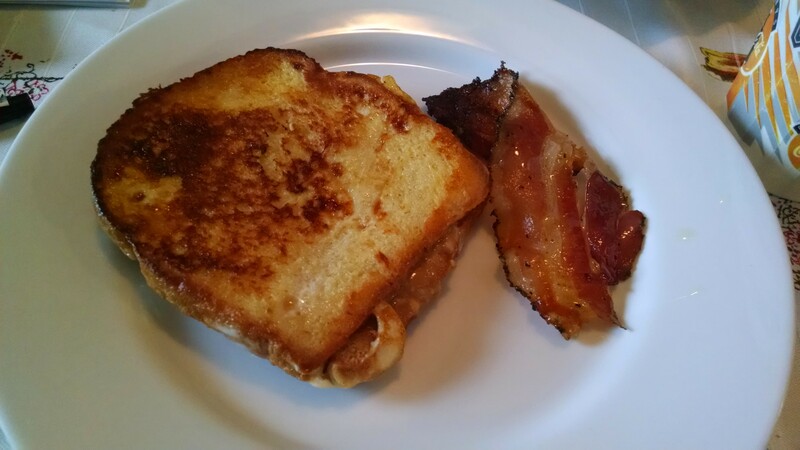 I did not know about the best way to cook bacon until I made this dish! There’s even a website devoted to it. 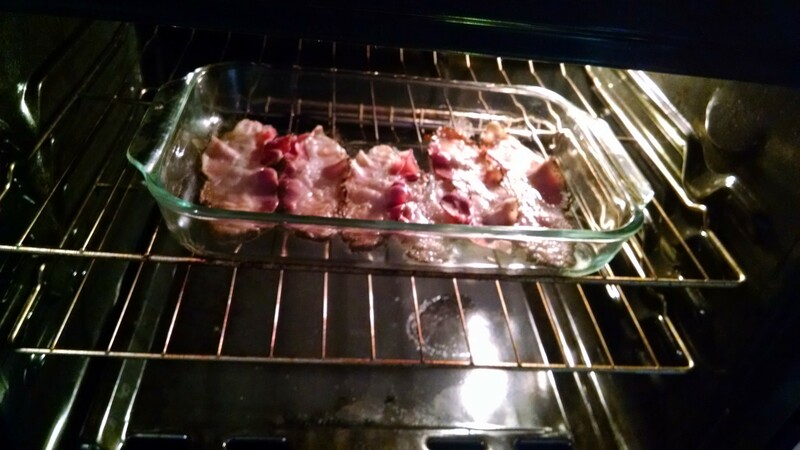 Just put your bacon into a baking pan and put into the cold oven. Set to 400, and set the timer for 20 minutes. That’s it! Magical crispy bacon every time. Don’t bake on the stove! And that way you can prepare the rest of the dish while the bacon is cooking. 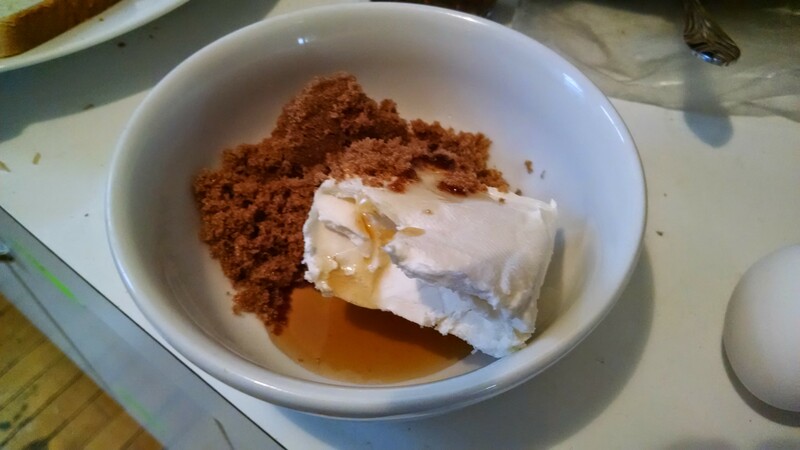 Make the filling: mix cream cheese with brown sugar and a dash of maple syrup. I used half a block of cream cheese, and a little less than that amount of brown sugar. You can’t really have too much of this filling. It’s SO GOOD. 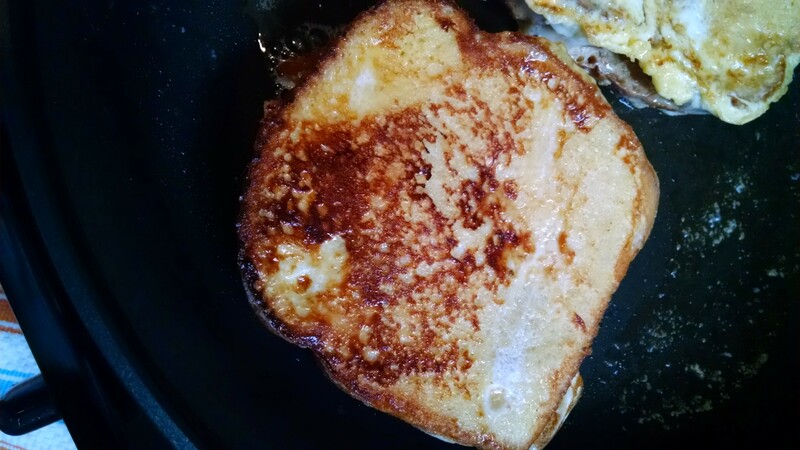 The big plus of using eggnog for french toast is that you don’t have to measure anything, really. Just whisk (number of people) eggs in with some eggnog (1/2 c per person or so). A pie tin is the best vessel for this, so you can dip your bread. Then spread your bread with the deliciousness, and put a piece of bacon in every other piece of bread. 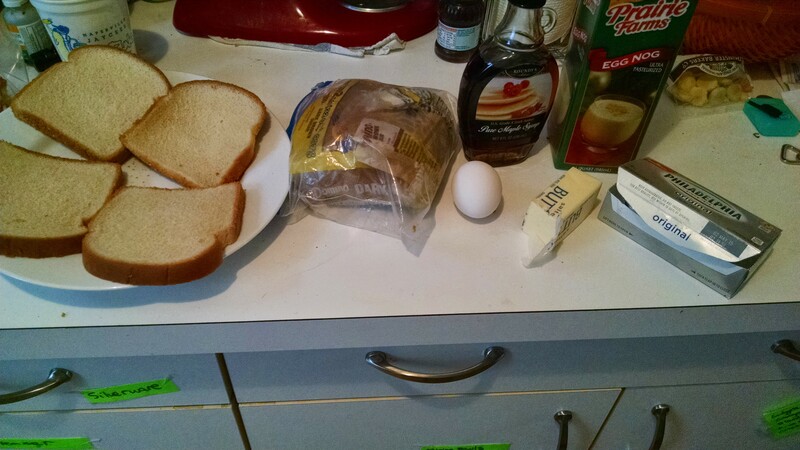 Make little sandwiches of wonderful, and quickly dip them in the eggnog mix. Fry for about 3 minutes on each side, or until they’re nice and brown and yummy looking. Usually people serve french toast with syrup but this basically has syrup inside it. It’s very good with a side of bacon. 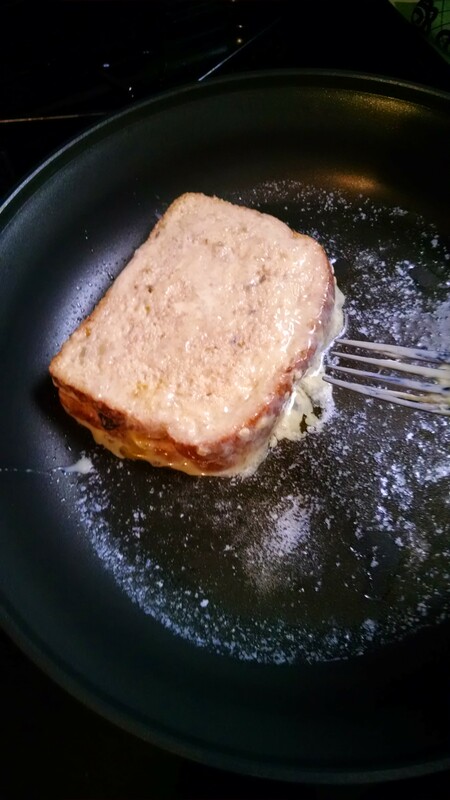 Bacon stuffed eggnog french toast. This is ingredients per person. Two pieces of good bacon-one for stuffing and one for eating. If you’re using the thin little slices double this. If you’re literally making this for one person, don’t dirty another pan and just cook your bacon in the pan you’re planning on using. 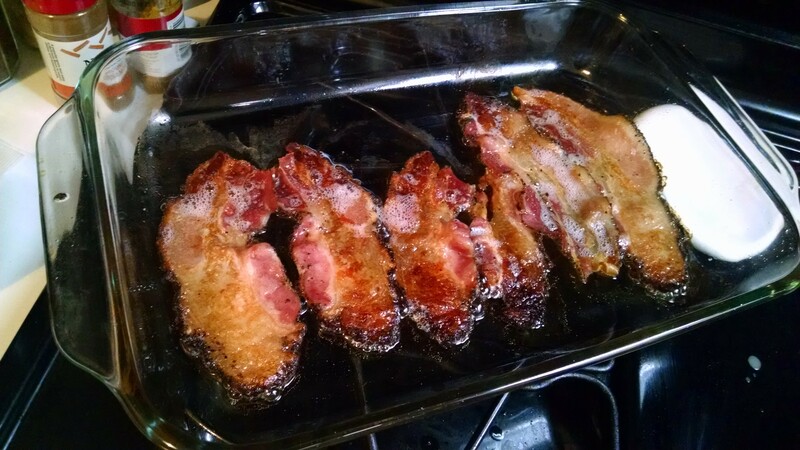 If more, though, use the bacon method– line a pan with bacon and put into a cold oven. Turn to 400 degrees, and set a timer for 20 minutes. Beat the egg and eggnog together in a pie pan. 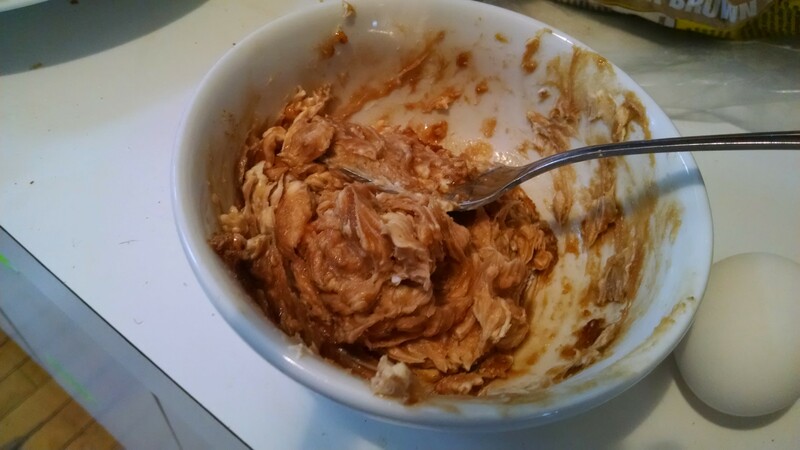 Mix the cream cheese, brown sugar, and maple syrup together. 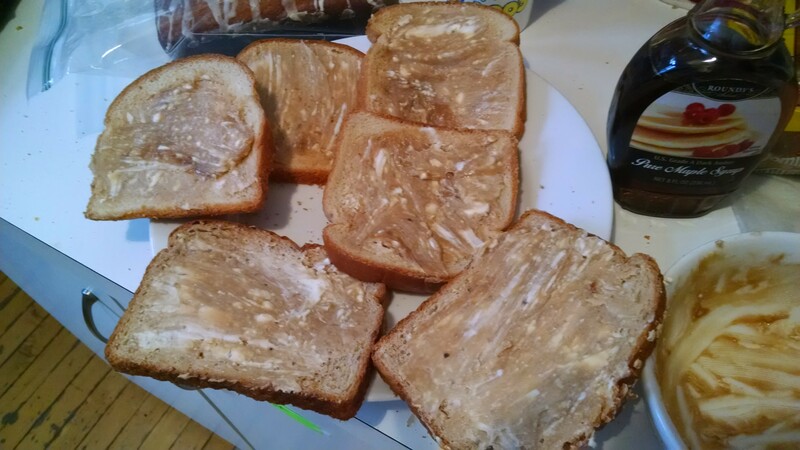 Spread on the bread slices. 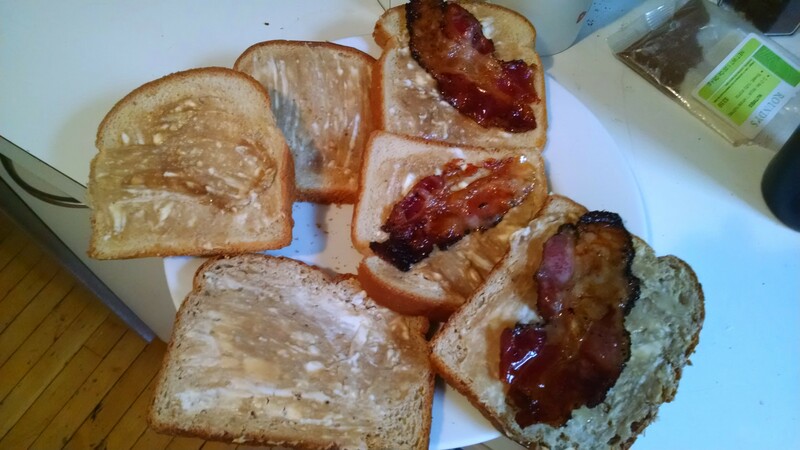 Break a piece of bacon in half and put into a sandwich. 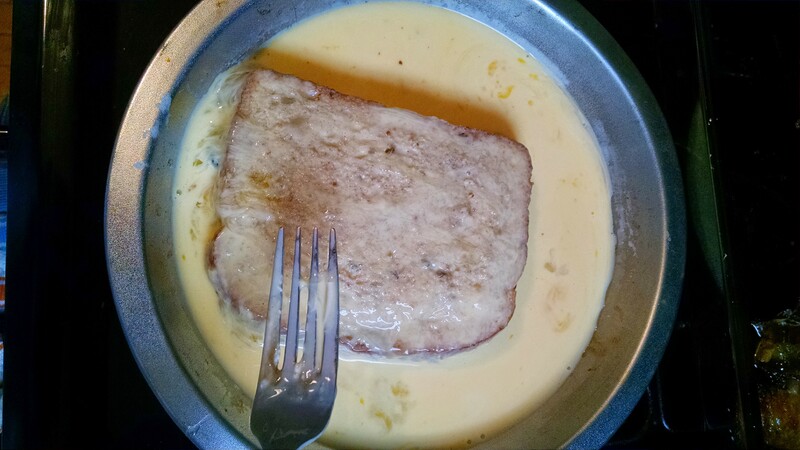 Dip both sides of the sandwich into the eggnog mixture, and fry in a skillet over medium heat until nice and brown on both sides. Serve with the other piece of bacon. Carrot cake is my favorite kind of cake almost everyday (if you catch me on a nostalgic day I’ll say funfetti). I love the moist sweetness and spice of carrot cake plus the surprise of raisins, and cream cheese frosting makes everything better. But it takes forever to peel and grate carrots-even with a food processor you still have to clean the food processor afterwards. 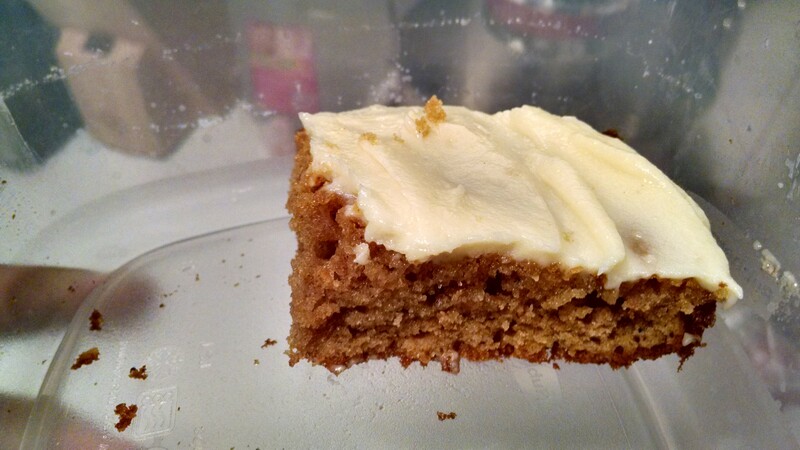 This cake tastes surprisingly like carrot cake, without the texture of carrots. Next time I’ll definitely add raisins and tell people it’s carrot cake and see if anyone believes me. Good thing I have friends who don’t read this blog! Another plus of this cake: two bowls! One if you’re real lazy! The recipe says “bars” but it really is just like a short cake. 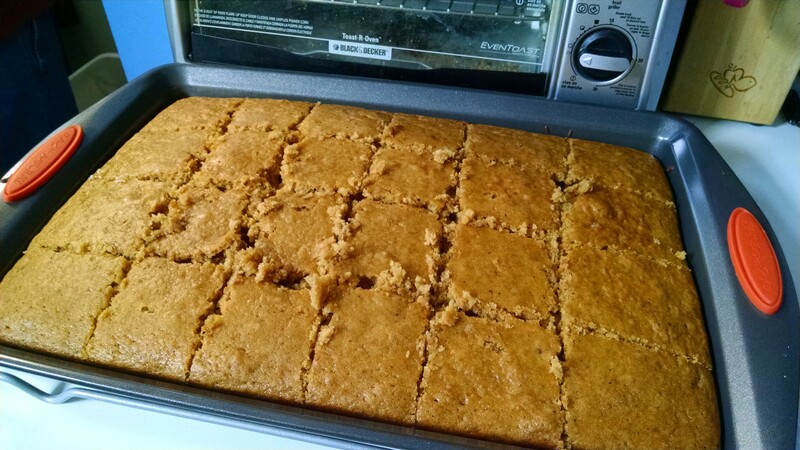 I made it in a fat cookie sheet with tall sides, but if you put it in a 9″x13″ it’d be a normal sheet cake size. Original recipe called for a cup of oil, which seemed like a lot, so I subbed in yogurt for some of it. Super moist and delicious! Also, peeve: doesn’t it make more sense to mix dry ingredients with a whisk first, then mix the wet with that same whisk, then mix them together? Often when I read recipes it says to do the wet first. 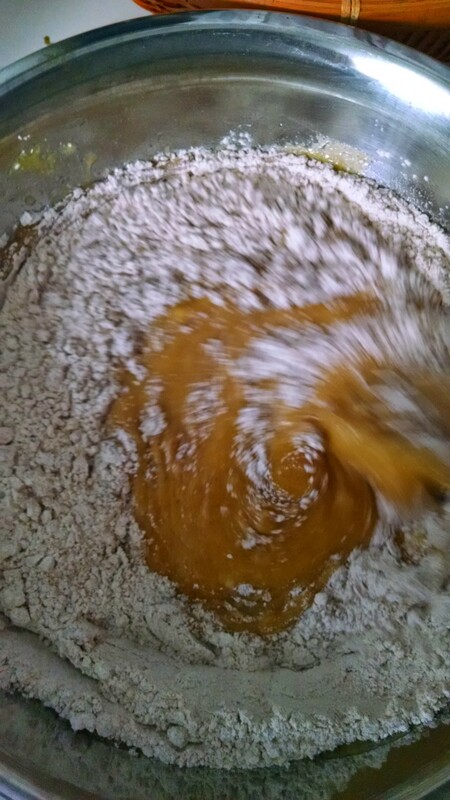 But then you have a wet whisk going into dry ingredients. Unless you’re fancy and use more than one whisk. 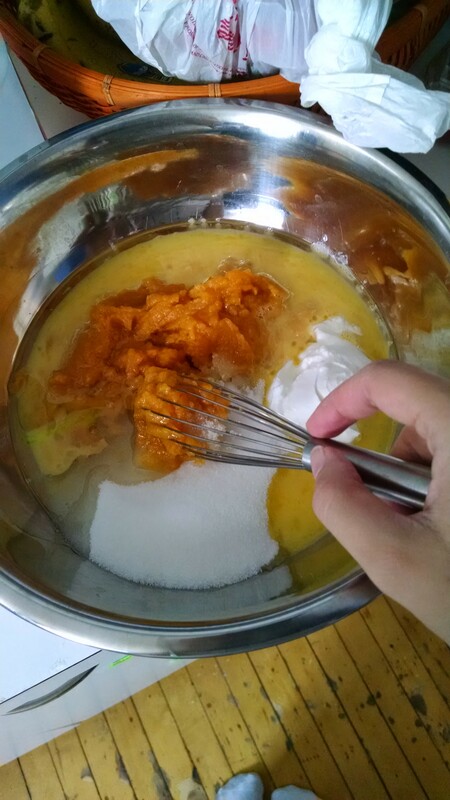 Anyways, you mix up all the wet ingredients: pumpkin, egg, yogurt, oil, sugar. 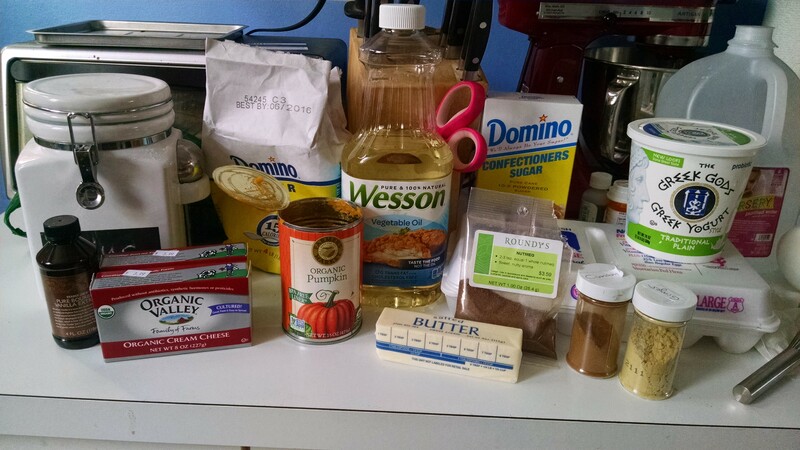 And separately, the dry: flour, baking powder, baking soda, spices. Sometimes I whisk I had a pun-making machine. Then I remember I have myself! If I remember right, the protagonist of A Wrinkle in Time gets made fun of in school a lot because her family’s a little crazy. I think a great nickname would be NutMeg. 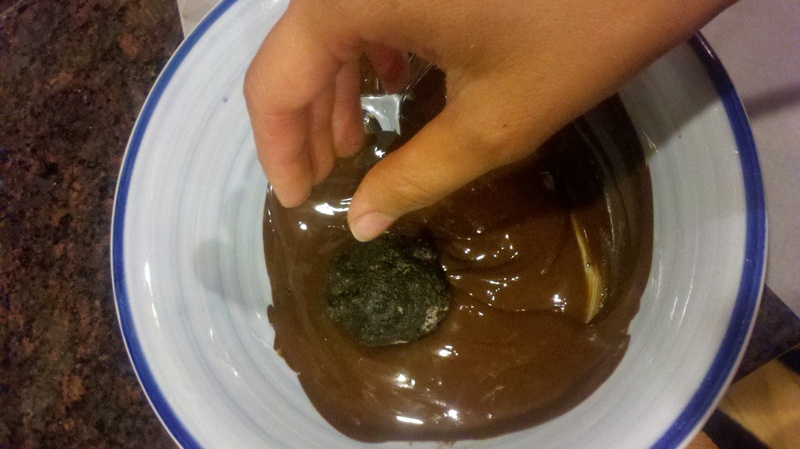 Then mix the two together, and pour into a greased pan. Turns out I own some nonstick bakeware (whaaaat?) so I didn’t bother greasing. Or taking a photo. While that bakes, make the best part: cream cheese frosting! Beat up some butter, cream cheese, powdered sugar, and a bit of vanilla. 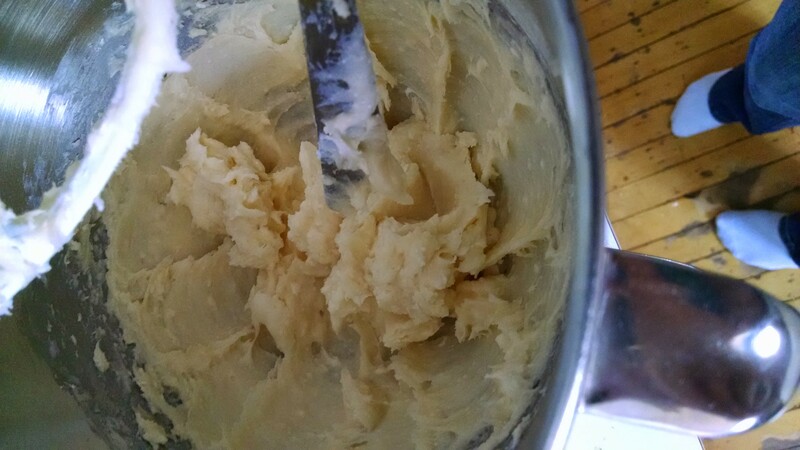 This is now a thick buttercream frosting. Add some milk, a bit at a time, until it’s the right texture for you- this’ll change depending on humidity etc. I used two tablespoons. After the cake cools a bit, frost it and cut it into bars. This is the wrong order- frost, then cut. This cake is SO DELICIOUS that 28 hours after baking it, I had one square left to take a picture of. Preheat oven to 350. Mix first five ingredients together in a bowl. 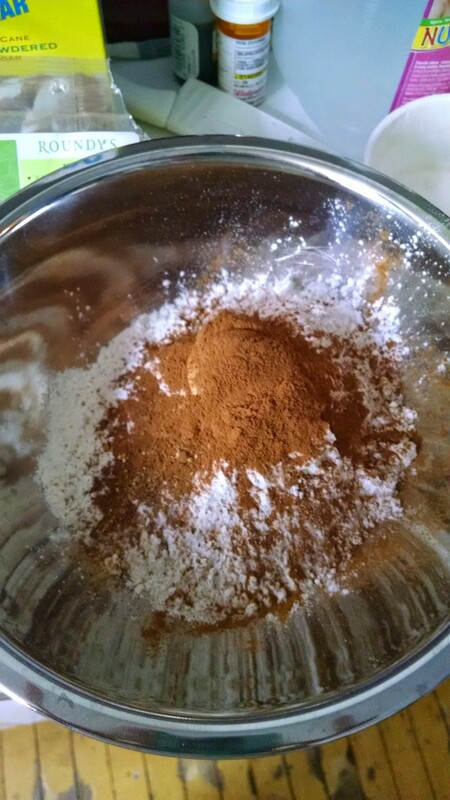 Separately, mix the dry ingredients. Then mix the two together. Add raisins and/or nuts, if using, now. Pour into a 15″x10″ pan if you have one, or a 9″x13″, or whatever you want. For the 15″x10″, bake 20-25 minutes or until a toothpick comes out clean. Let cool. Beat the cream cheese and butter together. Add powdered sugar and vanilla and beat. Then add milk 1 TB at a time until you have the consistency you want. Spread on bars. Very quick post during the workday. I made these last night for administrative professional’s day today (which no one knows about). They’re delicious, super rich and addictive and absolutely horrible for you. 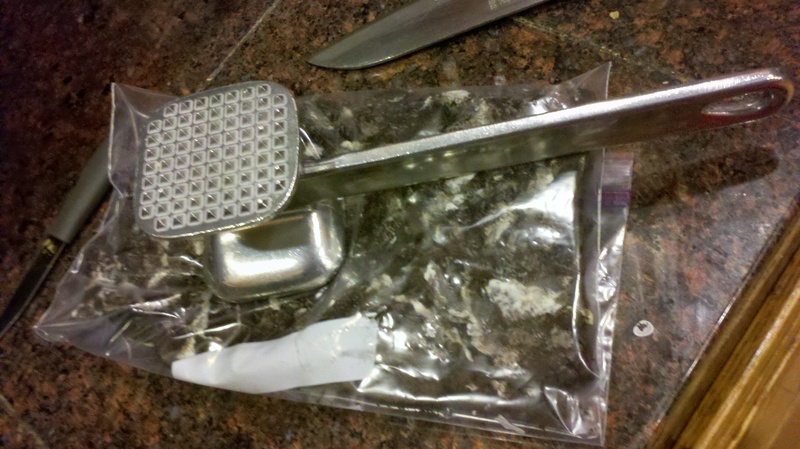 No baking involved- in fact, I used a plate, a plastic bag, and a meat tenderizer as my tools. Plus there’s only three ingredients. 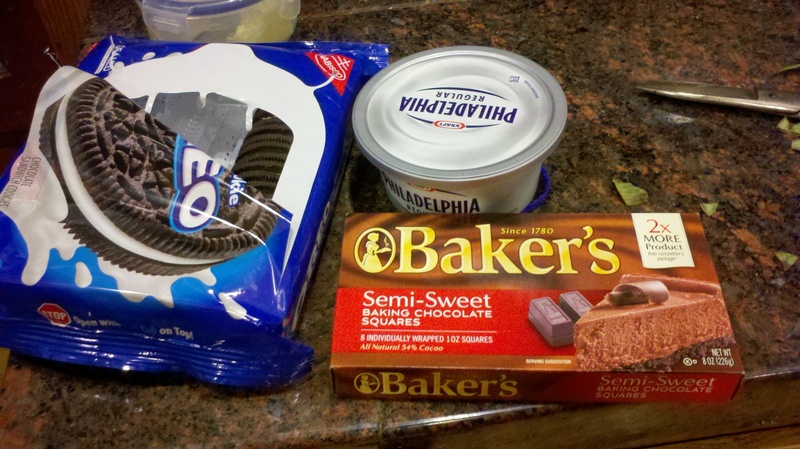 Three ingredients: cream cheese, chocolate, andeo. 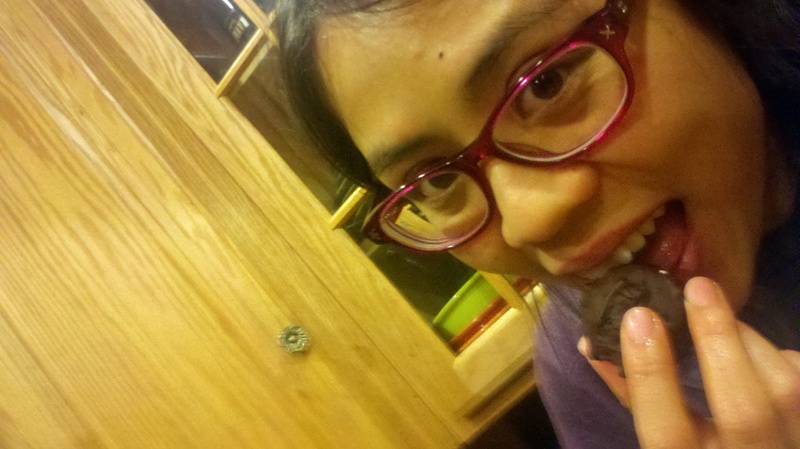 Oops I mean OReo. If Jackie Chan and Chris Tucker were in my kitchen I wouldn’t even need the mallet for this to be Crush Hour. 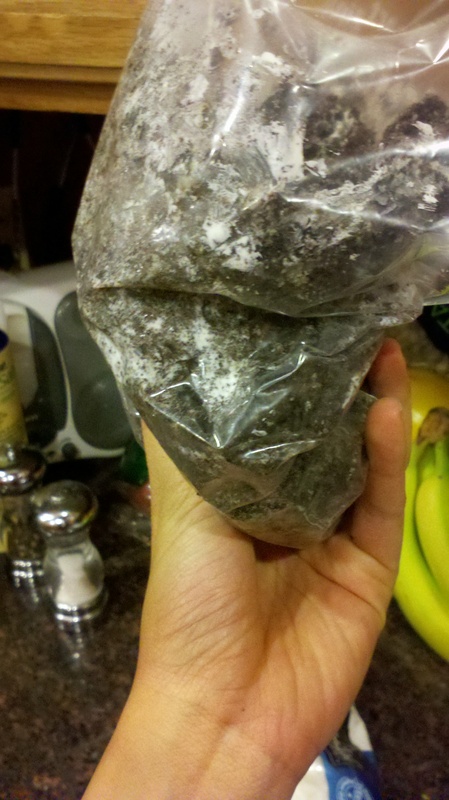 Next, plop your cream cheese into the bag and smoosh it around with your hands. Again, this step could be done with a food processor, but smooshing is so much fun! Would a basketball-playing cow yell SMOOOOOOOOOSH when hitting nothing but net? Then roll the resulting mixture into sticky balls, about an inch in diameter, and throw them in the freezer for a few minutes (I ate an artichoke in this time and it seemed about right). 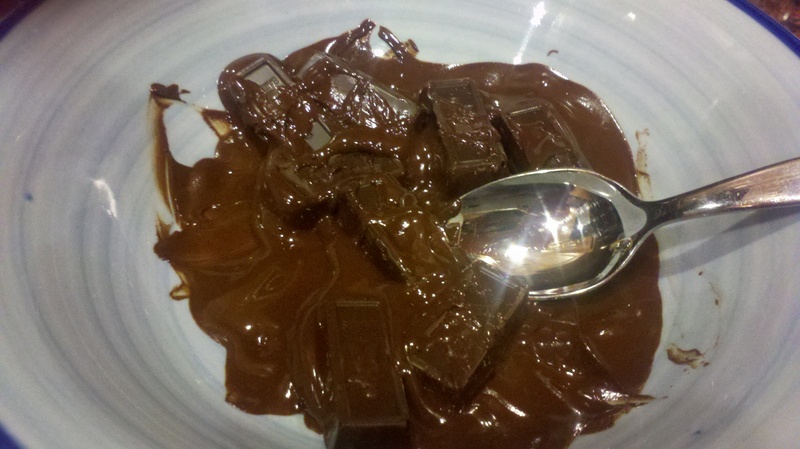 Meanwhile, melt your chocolate. I used Baker’s semisweet because that’s what Kraft said to do, but anything will do: dark, white, whatever. It’s so easy to melt too: 30 seconds in the microwave, stir, 30 more seconds, stir. When it comes out after the second 30 seconds it’ll still be in those soft bricks, but just stir and the residual heat will melt it. 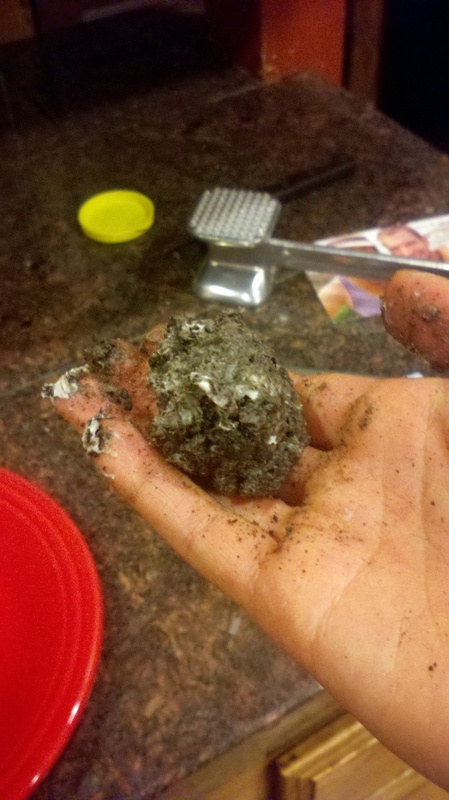 Then roll your frozen oreo balls around in the chocolate, and throw them on some parchment paper to set. I also sprinkled some of mine with coconut. I used a shallow bowl here, but if Adele were around I’d use a deeper one. Ah, we could have had it all. They’re ready to eat as soon as you want to eat them, though Kraft says to do it after an hour. THESE ARE SO DELICIOUS and so bad for you. There’s nothing good in them. And that’s why they’re so good. 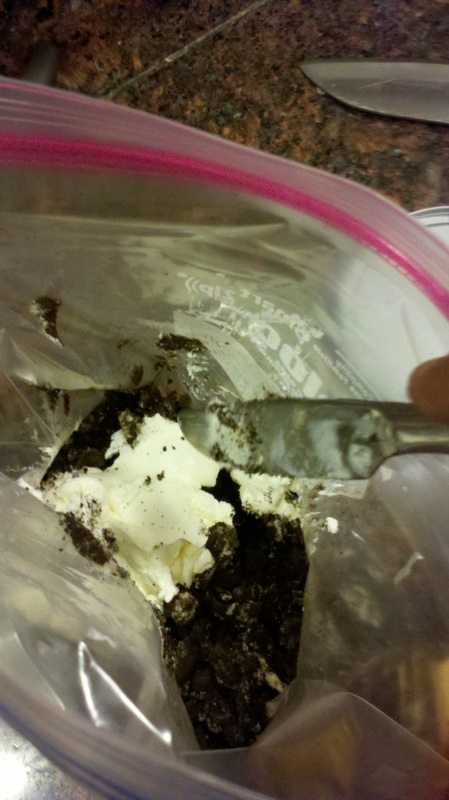 Crush 28 Oreos in a plastic bag with a meat tenderizer/hammer/heavy bottle. Some people use hand mixers/food processors. 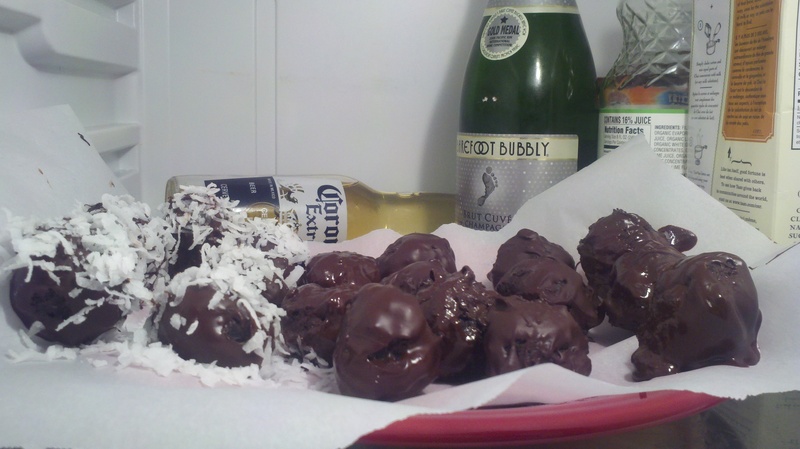 Melt 6 oz semi-sweet or white chocolate, and roll each ball in the chocolate. Lay out on parchment paper. Refrigerate for an hour or as long as you want to.